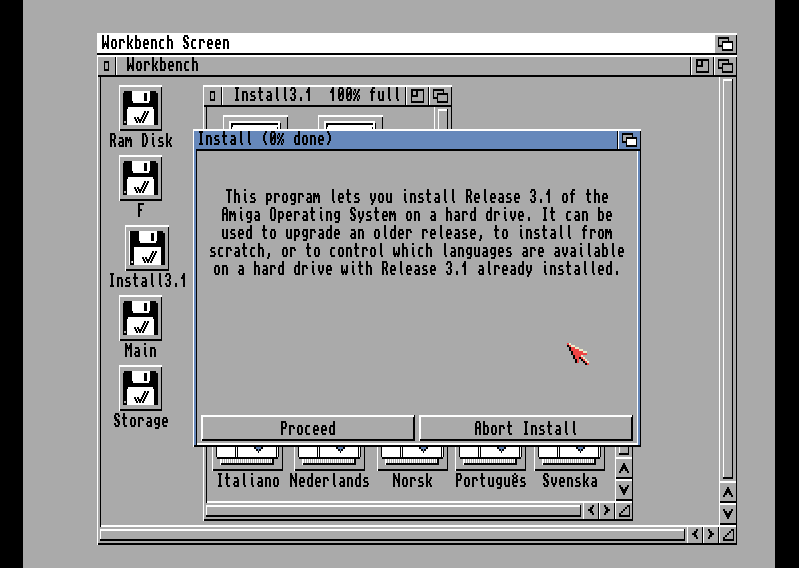 Now that we have CF card all set up lets see how to install Workbench and set it to automatically load patched/updated scsi.device so we don’t have to worry if it’s loaded or not. If you’re directly continuing from last post you should have patched scsi.device loaded. If not, repeat the procedure with shell and loadmodule. 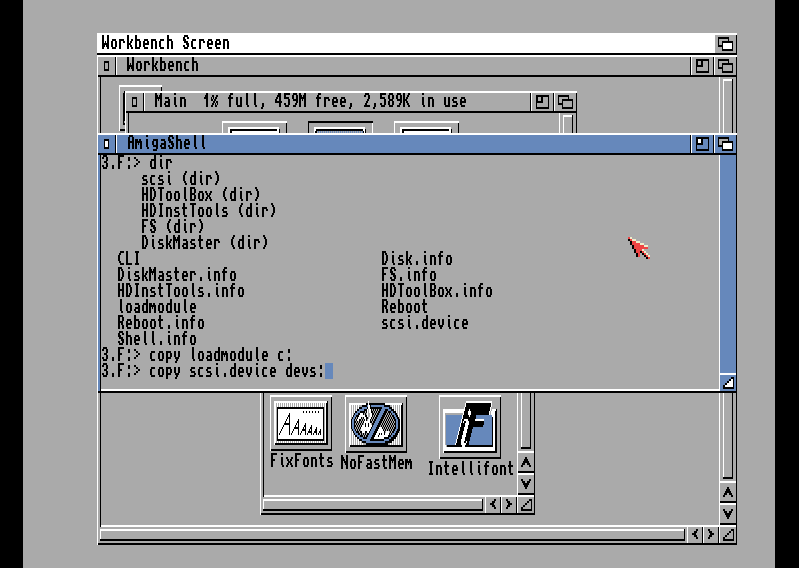 After that’s settled “insert” Workbench install floppy, after it’s been detected open it and open “Install” drawer. 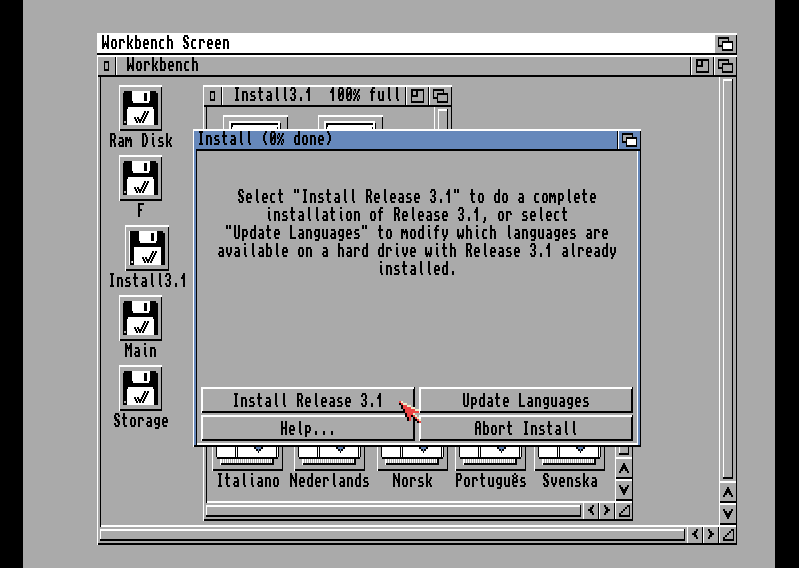 Run installer of desired language, I’ve chosen English. 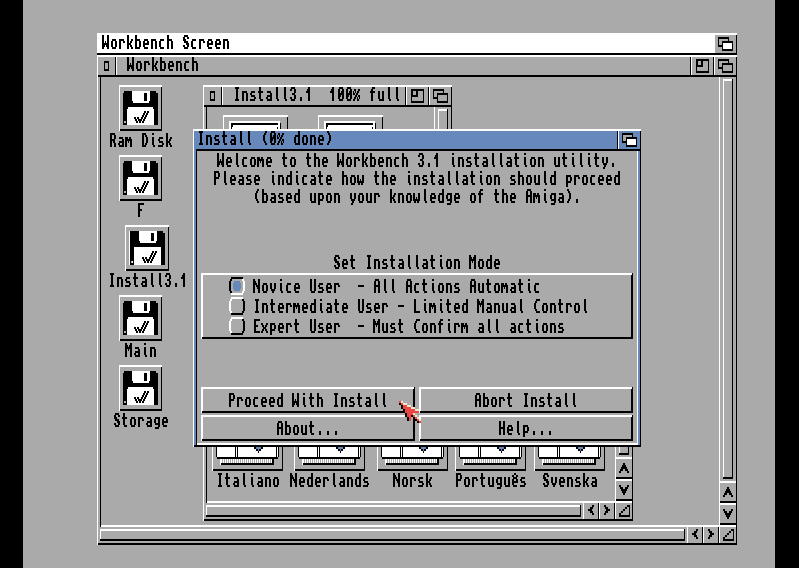 Proceed with Workbench install, it’s pretty straightforward, I won’t go into details. 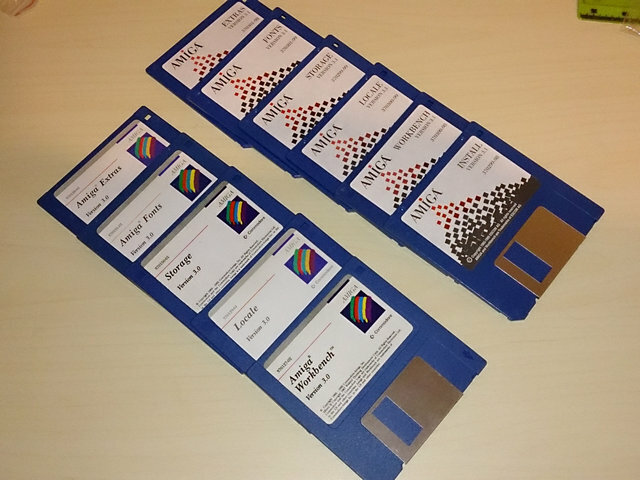 Basically just click next, choose Novice User, choose language, keyboard map and what, if any, printer driver is going to be installed and after these few options just change floppies how it instructs you. 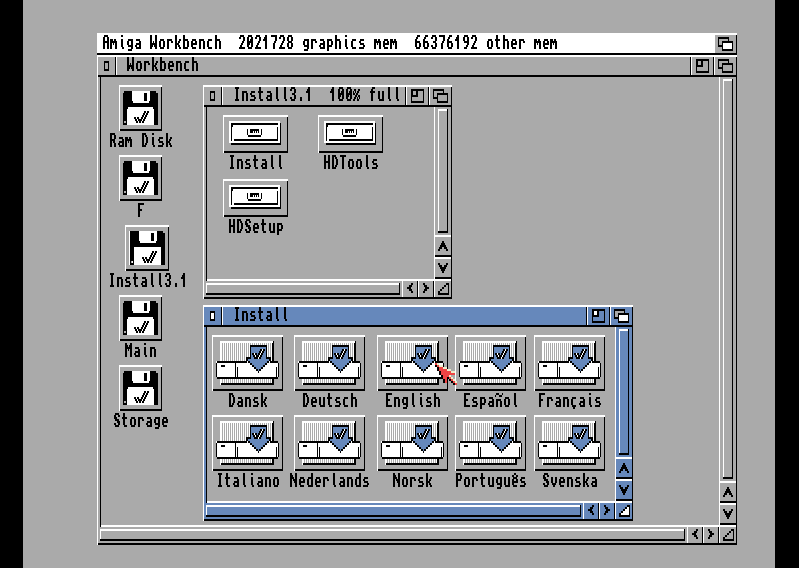 This will install Workbench on DH0: partition, if you want to specifically choose some other partition you’ll have to select Intermediate or Expert user when choosing Installation mode. 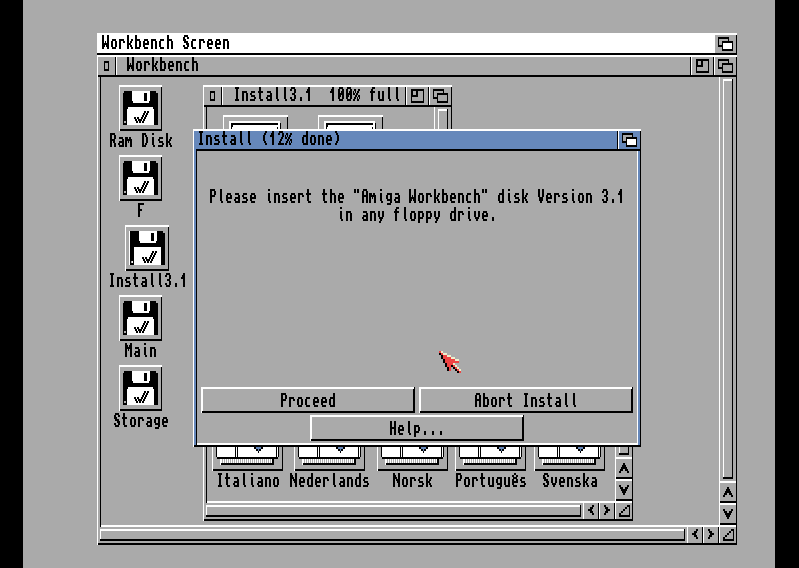 After it’s done (and it shouldn’t take too long, if you have WinUAE floppy speed emulation on turbo) it’ll ask you to remove floppy and click “Proceed” button, so do so (F12, Floppy Drive, “Eject” button). 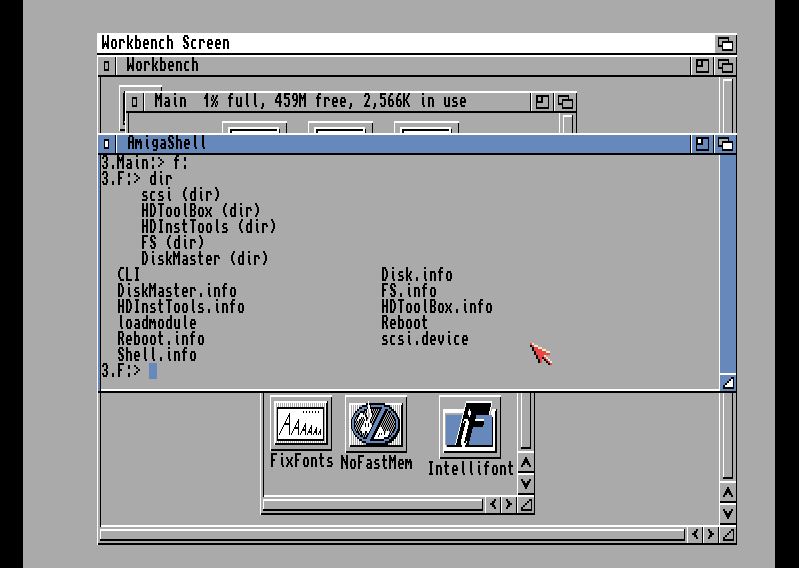 After it reboots (this was also soft reboot, so patched scsi.device is still active) you’ll be greeted with Workbench that booted from CF card. 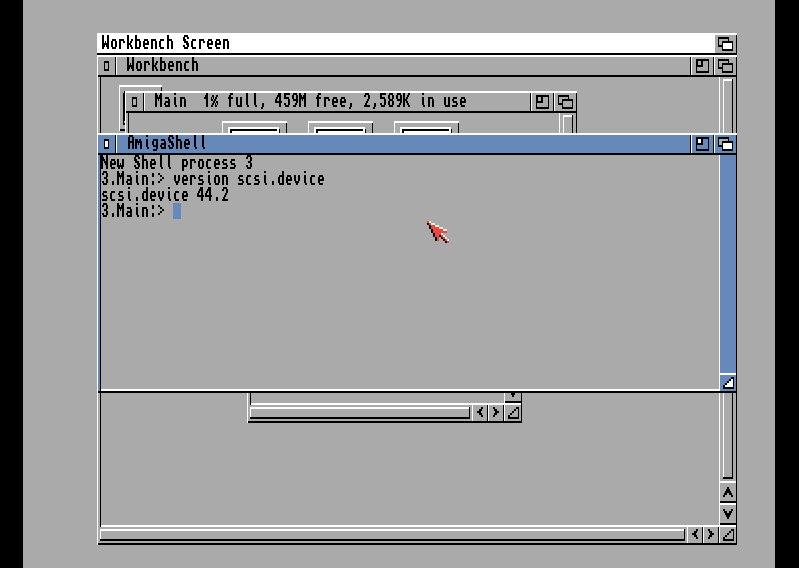 Now start Shell again, either from F folder, or go to HDD partition, open System drawer and run Shell from there. 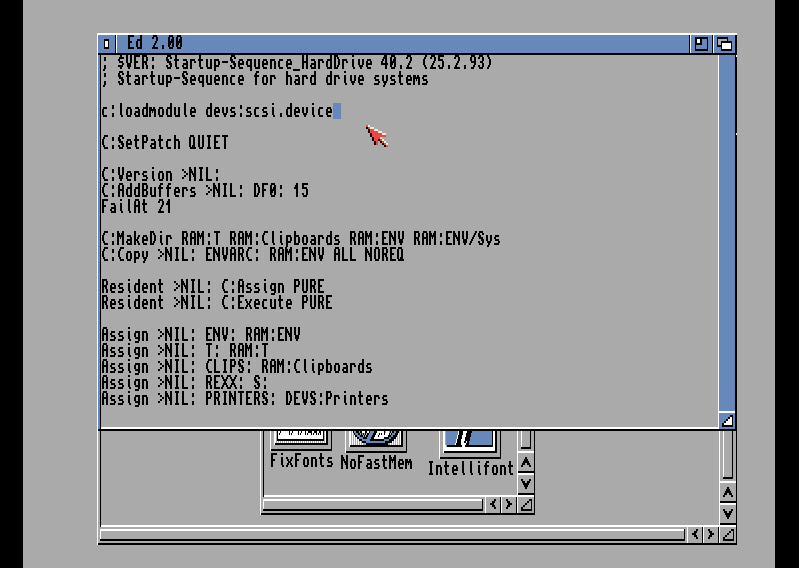 Now we need to copy loadmodule tool to folder C on system partition and scsi.device to folder Devs on system partition. 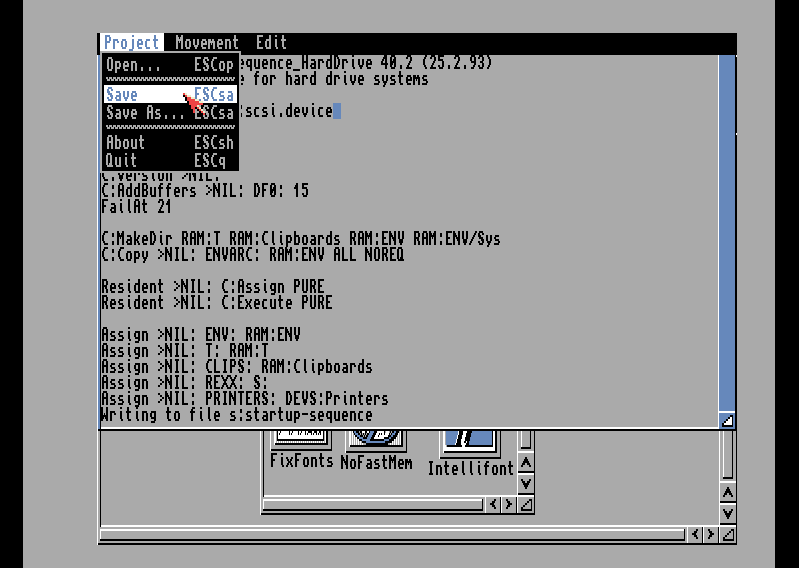 Type “copy loadmodule c:”, enter, and “copy scsi.device devs:”, enter. Finally we need to edit startup-sequence file to include loadmodule. Type “ed s:startup-sequence” and confirm with enter. 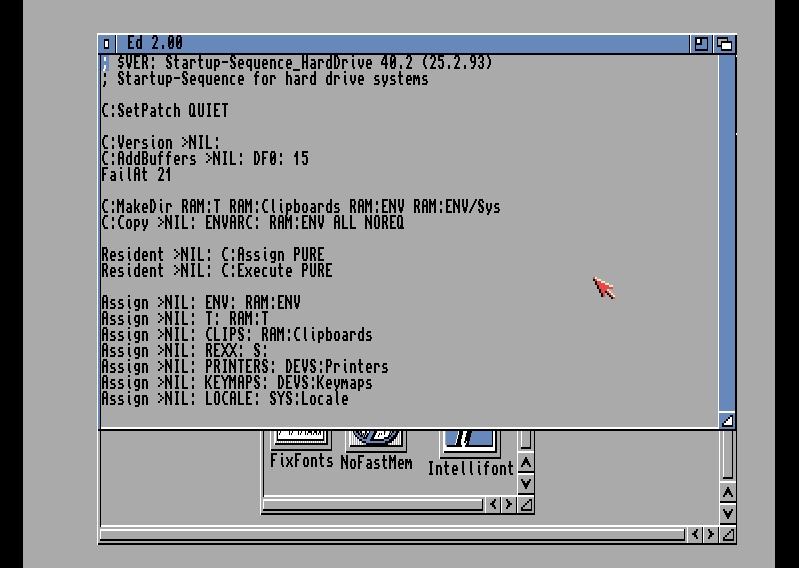 This will open startup-sequence file in Ed editor. Position yourself above “C:SetPatch QUIET” line and write “c:loadmodule devs:scsi.device”. Press right mouse button, go to Project, choose Save, and again right mouse button, Project and, finally, Quit. Now everytime you boot from this CF loadmodule will load patched scsi.device if it isn’t already loaded. You might notice a bit longer boot time because it will automatically reboot when it loads it first time. That’s it, workbench is set up. 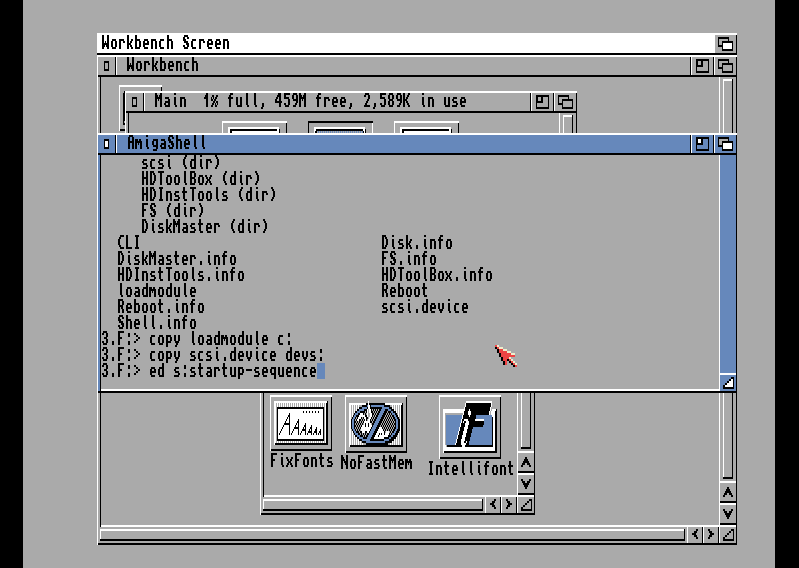 You can now connect this SD card to real Amiga and Workbench will load from CF same as on WinUAE. 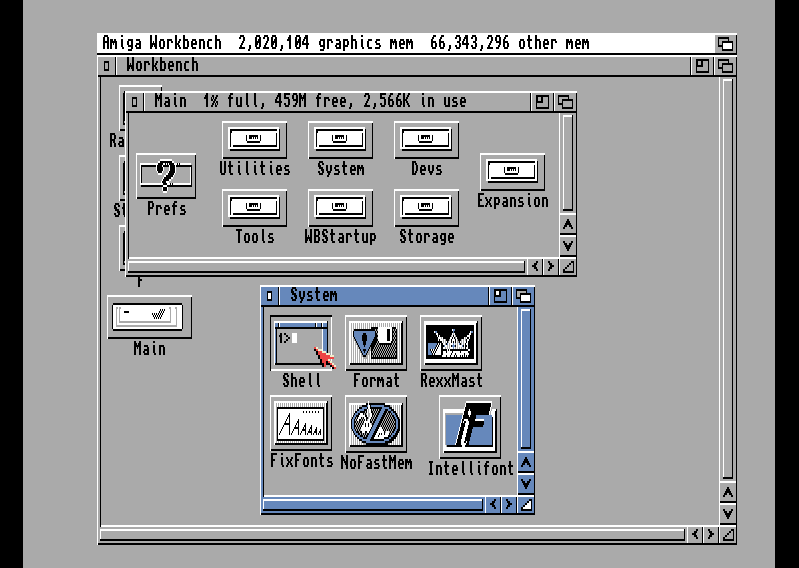 Posted on October 13, 2015, in Amiga, Commodore, Retro computing and tagged Amiga, CF, Compact Flash, Partition, scsi.device, Workbench. Bookmark the permalink. 1 Comment. 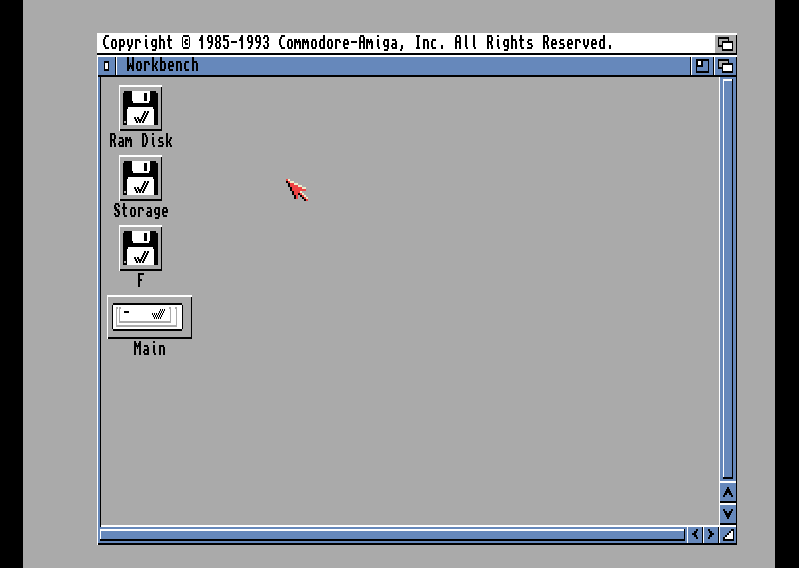 SD card loads fine in WinUAE but I get a grey screen on the Amiga 1200, which then turns black after 20-30 secs?